Think adults get to have all the fun on a cruise? Think again. 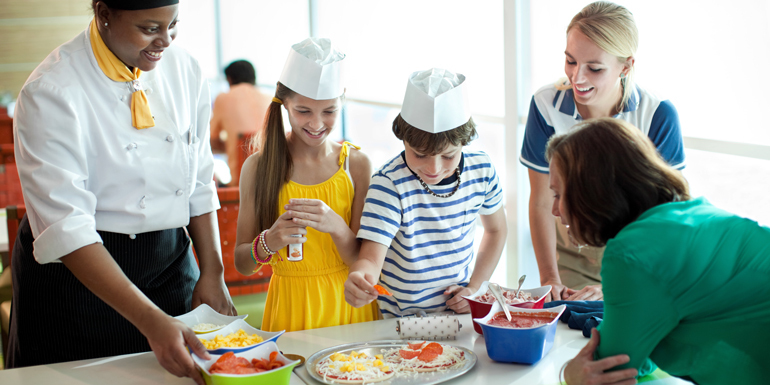 Onboard kids’ clubs fill their daily itineraries with activities that rival those for grown-ups — you might see cooking lessons, theme parties, and even foreign language classes. You can pick up the activities schedule on your first day and decide which ones to join based on your child’s interests ... and, with the astounding variety available, that shouldn’t be a problem. Security is, understandably, tight. Typically, registration opens on the first day of the cruise. After the paperwork is filled out, some cruise lines — including Disney Cruise Line and Norwegian Cruise Line — give toddlers and tweens a wristband to wear, indicating their participation. Should children have any special needs, several lines — including Disney and Celebrity Cruises — also offer pagers to parents so they can be notified of any issues that arise. Teens, however, are often given the freedom to come and go from the facilities throughout the day. With more than 700,000 children sailing on Carnival ships each year, the line keeps its youth programs fresh. One big change taking place through 2016 is the Fun Ship 2.0 transformation of Camp Carnival into marine-themed Camp Ocean. But for now, all Carnival ships except Carnival Freedom — the first to add Camp Ocean — offer Camp Carnival for 2- to 11-year-olds, as well as tween and teen areas. Ages 2-11: Little ones are separated into age groups — 2-5, 6-8, and 9-11 — to participate in age-appropriate activities. 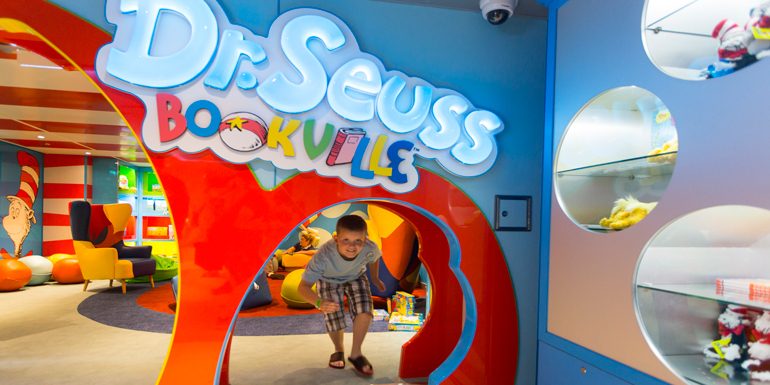 The newest kid-friendly add-on is Dr. Seuss Bookville reading area on Carnival Freedom. Parents and little ones can read, join storytelling sessions, and play games. For parents who want to check out the nightlife onboard, the Night Owls program lets kids stay up late playing trivia games, eating pizza, and getting their faces painted. Note: Camp Carnival is free, but Night Owls costs $6.75 per child, per hour and runs from 10 pm to 3 am, depending on the age group. 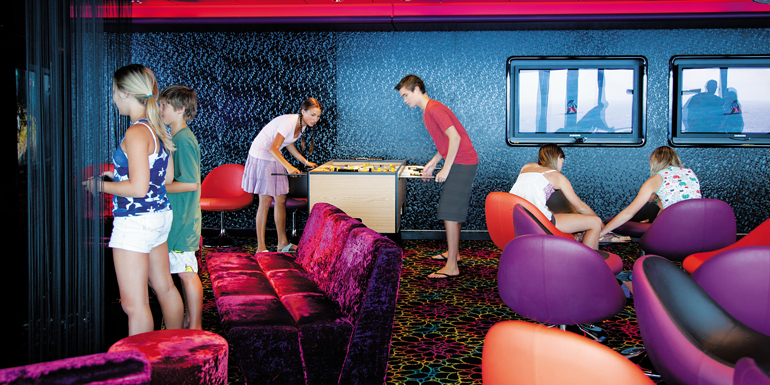 Ages 12-14: Circle C is a funky, tween- and teen-only lounge onboard all ships where kids can be found singing karaoke, playing "Rock Band," or battling friends in a dance-off. 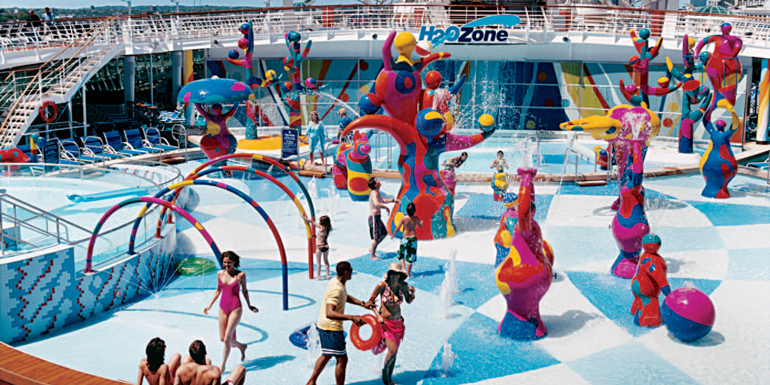 They can also go up on deck and play mini-golf, ride waterslides, or pose for photo shoots set up around the ship. Ages 15-17: High schoolers have a place to call their own in Club O2. The décor is mellower than that in Circle C, with space to lounge around with fellow cruisers and individual TV areas for quiet time. On port days, the ships host teen-only shore excursions so kids can opt to explore with new friends. Celebrity’s youth programs stand out for offering some cool, cutting-edge activities not currently found on other lines. Ages 3-11: The Fun Factory has basic offerings, such as arts and crafts, board games, and movies, but it also has a few extras. Kids can learn to roll sushi, discuss nutrition, take cooking lessons, and join singalongs. LeapFrog toys can be checked out and used by little ones when they’re not inside the club. In addition, the cruise line offers teens the option of participating in iTake, a unique four-hour program that allows aspiring film directors to create storyboards, shoot videos with GoPro Hero 3 cameras, and edit their films in the Celebrity iLounge. After the screening, teens are honored for their efforts at the weekly XClub Film Festival & Award Ceremony. Costa Cruises Fun@sea program consists of four clubs for junior cruisers. Because the cruise line is Italian, some activities may be led in the Italian language, depending on the makeup of the groups. Ages 3-6: Costa’s Squok — half-shark, half-dolphin mascot — is the inspiration for several Mini Club events, such as competing at “Squolympics,” dancing at Squok’s disco, coloring life-size pictures of the character, and marching in parades. Masquerade parties, treasure hunts, and T-shirt painting may also be on the agenda. Ages 7-11: The Maxi Club’s list of activities is diverse, from lessons in tying a proper sailing knot to classes in how to be a mime, speak Italian, or make sculptures with balloons and clay. There are even opportunities to interview the captain to find out what it’s really like to be the head honcho onboard. Ages 12-14: It may feel like you just walked into a circus at the Teen Junior Club, where kids can be found studying magic, juggling, pantomime, and clownery. Or they might be learning the steps to different dance styles, such as capoeira, Latin, or hip-hop. Ages 15-17: The Teen Club gives young adults the chance to explore potential career interests in photography and moviemaking, or they can take jewelry-making lessons, find out who their secret admirer is at the Cupid’s Night party, and enter the ship’s Miss and Mr. Teen competition. 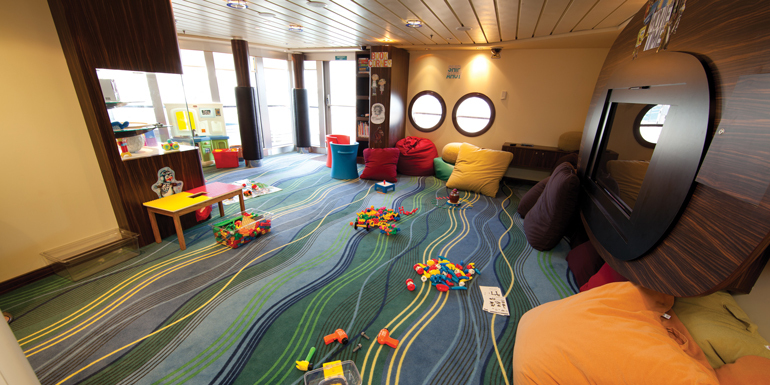 While Cunard's trained British nannies are busy caring for the littlest cruisers, older kids can play around in the vibrantly decorated age group-defined “zones” onboard each ship. Ages 2-6: The Play Zone hosts many theme days, such as Wild West Day, Circus Day, Oscar Bear Day (featuring Cunard’s cuddly mascot), and Sweets and Treats Day (where kids get to create their own chocolate bars). While The Play Zone is closed midday, children and their parents can sit down to traditional afternoon tea together. Little ones under 2 years old are welcome to join activities as long as their parents are with them. Ages 7-12 & 13-17: Because The Zone and The Teen Zone can be put together on cruises with few kids sailing, the activities rosters can be similar. Table games include pingpong, foosball, and air hockey, and there are comfy couches where kids can play Xbox games or watch the latest blockbuster movies. On certain evenings, teens can have the G32 nightclub all to themselves to dance and socialize — with chaperones, of course. 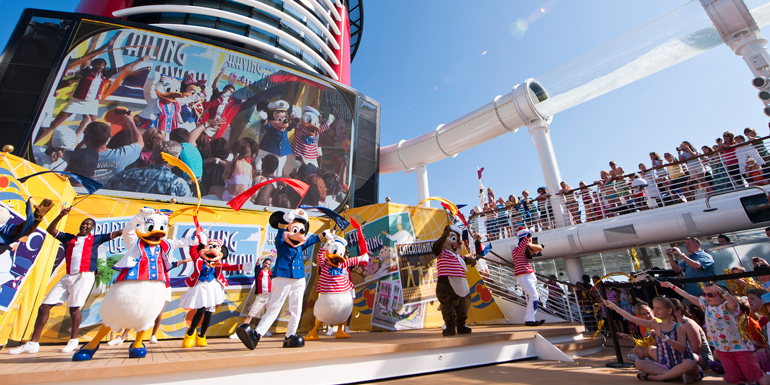 There’s good reason Disney Cruise Line won gold in our 2014 Cruiseline.com Awards for Best Services for Children 3-12 and bronze for Best Services for Teens. Disney really knows how to bring its animated movies to life in fun and educational ways for young cruisers, and give tweens and teens their own stylishly designed spaces in which to hang out. 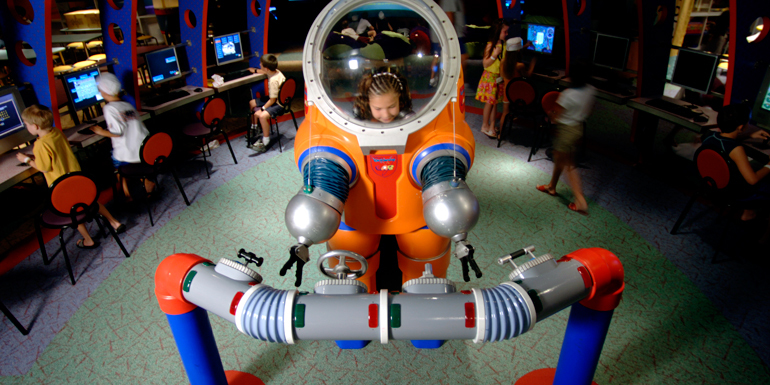 Ages 3-12: The Oceaneer Club and Oceaneer Lab are connected by a hallway that lets kids go from one room to the other. Each space immerses little ones in the world of Disney with themed activities — for instance, they can decorate pillowcases with Pluto at a pajama party, protect Woody alongside green army men at Toy Story Boot Camp, or dress up like a prince or princess at Cinderella’s Royal Ball. We also like the Ratatouille Cooking School, in which kids don chef hats and aprons and bake chocolate chip cookies alongside a professional chef. Ages 11-14: At Edge, tweens and teens have the chance to relax with friends or participate in events like shipwide scavenger hunts, pirate-themed trivia, karaoke, and pool parties. Ages 14-17: Vibe features a lot of the same offerings as Edge, but in a more grown-up environment that was specifically designed to look like a college dorm rec room. Here, teens can test their acting chops at an improv comedy show, take a teen-only fitness class, or head outside to the ultra-chic private deck area to lay out on a lounger. When a cruise line advertises “kids sail free,” it’s important to impress both the young cruisers and their parents with the ways it entertains them once onboard, and MSC certainly does that. While its youth programs vary from ship to ship, each has its own draw in the different age categories. The programs also can be conducted in nearly any language, so all kids feel comfortable to play and interact. Ages 3-6: MSC’s Smurf mascot makes many appearances in the Mini Club throughout each sailing, from the family disco party to the talent show and the cooking competition — where the ship’s pastry chef demonstrates how to make cakes and biscuits. The playrooms are painted in bright, fun colors and come with themes, such as the Stone Age dinosaur area on MSC Poesia or The North Pole on MSC Fantasia — complete with igloos and life-size polar bears. Ages 7-11: The Junior Club is great for active kids — since soccer, volleyball, and basketball tournaments are a mainstay on the daily schedule — but there are plenty of creative activities for tweens who’d rather stay in and try a new craft, too. Children can even write articles or sketch cartoons and see them published in the ship’s kids’ newsletter. Ages 12-14: The newest video game consoles, friendly sports matches, and pool games keep kids in the Y-Team busy each day. The new 4D Cinema on MSC Splendida and MSC Fantasia is a huge hit with this age group, too. The experience feels less like a movie and more like an amusement park ride, as you’re buckled into a seat that shakes and moves around every corner through a “haunted mine” or “cosmic coaster.” Each ride is about five minutes long and costs 6 euros, or about $8. Ages 15-17: The MSC Generation Teen Club on MSC Divina holds a few signature events that have gained popularity, including a dance party under the moonlight on the lido deck and a flash mob workshop. Because teens have more freedom onboard, parents can set them up with a prepaid My Teen Card, which lets 12- to 17-year-olds make onboard purchases while they’re away from Mom and Dad. With each new ship, Norwegian keeps upping its entertainment game — from the most bowling lanes to a ropes course that has you walking the plank and the first rappelling wall. Its children’s offerings are just as exciting. Ages 3-12: The Splash Academy divides kids into three age groups: Turtles (3-5), Seals (6-9) and Dolphins (10-12). Highlights include lessons in scarf juggling, plate spinning, and acrobatics, as well as Superspy Mission Impossible — where kids work together to find clues and solve mysteries). 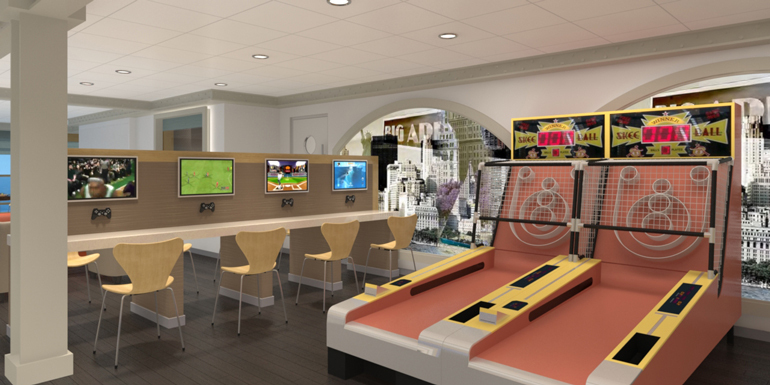 Ages 13-17: By day, the Entourage teen area is a place to relax with a book, chat with friends, and play arcade games; by night, it turns into a teen-only nightclub, where kids can pick their favorite songs on the jukebox and watch music videos on a big flat-screen TV. There are also plenty of reasons to get outside when the sun goes down, including soccer and dodge ball games. All Princess ships — except Ocean Princess and Pacific Princess — have designated kids’ clubs. They open only on sailings carrying 20 or more 3- to 17-year-olds. The list of activities is education-based, but not as extensive as that on more kid-friendly lines. Ages 3-12: Kids are broken up into two age groups: 3- to 7-year-olds make up Princess Pelicans, and 8- to 12-year-olds are considered Shockwaves. While Princess Pelicans may be busy learning about numbers and movements in the Kindermusik at Sea program or having a pajama party, Shockwaves may be conducting chemistry experiments or discovering the physics behind roller coasters by building their own mini versions. Ages 13-17: Along with teen-only formal dinners, talent shows, and hip-hop classes, there are also a few really cool events for young adults, including DJ workshops, makeover parties, and “mocktail” mixing competitions. Royal Caribbean took home gold in Best for Teens and silver in Best for Children (3-12) in the 2014 Bon Voyage Awards for its wide array of kid-friendly onboard entertainment. Whether it’s active, creative, or educational, these ships have something for just about every young cruiser. Ages 3-5: Adventure Art by Crayola introduces Aquanauts to various ports through crafts like kites, masks, and pottery. Kids can also build sandcastles or ride around in a Fisher-Price Cadillac Escalade or Barbie Jammin' Jeep on CocoCay and Labadee, the line’s private islands. Ages 6-8: This age group is called Explorers because kids can usually be found digging for dinosaur fossils, playing meteorology games, or uncovering buried treasure. In addition, the Adventure Theater by Camp Broadway program teaches theater arts through imaginative games and vocal exercises. Ages 9-11: Voyagers are typically out and about on the ship, taking exclusive tours, splashing in the water park, dancing at reggae parties, or playing sports like gagaball — an Israeli version of dodge ball. Ages 12-14: Young teens are free to come and go as they please from the teen-only Living Room lounge and Fuel nightclub. The arcade is also a popular hangout, with classic games such as “Pacman” and newer favorites like “Guitar Hero.” Daily activities include rock-climbing competitions, “Dance Dance Revolution,” barbecues, and open mic nights. Ages 15-17: Teens can use the FlowRider surf simulator, play in sports tournaments, or take advantage of the water park, mini-golf, ice skating, teen casino, or late-night pool parties. The YSpa also has special services just for teens, such as the Acne Attack facial and Beach Babe deep-conditioning hair treatment. 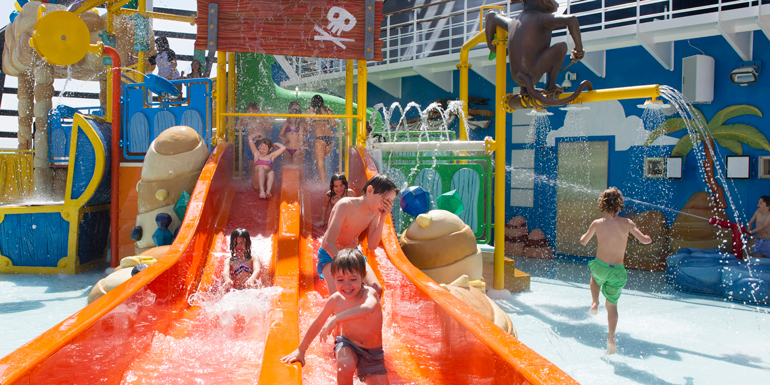 What is your child’s favorite onboard activity? Since my usual traveling companion is now 13 and we've been only aboard Carnival, Royal and Norwegian, unquestionably she prefers Carnival and Circle C in particular. She won't go on a ship that lacks a water slide, she says. Biggest disappointment was Royal, even though they have the best-equipped ships. Their kids facilities and the arcade are fantastic but their children's staff doesn't have the training and "kid-friendliness" you'd expect from people in that position, at least on Liberty of the Seas during our cruise. I'm not counting the cupcake decorating class, which my kid loved, because that was presented by a baker, not a youth leader. Everyone I've talked to who's taken kids on a Disney cruise remark at how amazingly well-structured and age-appropriate their activities and programs are. My goal eventually is to get her to graduate from high school so I can go on a ship without her, water parks, ropes courses, surf simulators and camp counselors. THEN maybe I'll be able to try HAL, Princess, Oceania etc.